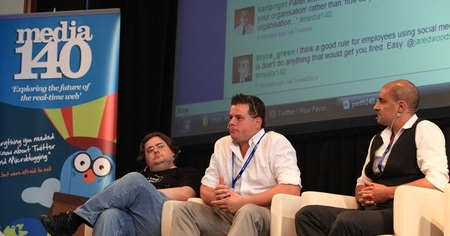 The Media140 event was held in Perth this week and I attended as a guest blogger. For me, one of the most interesting things about Media140 was seeing the effect of the Twitter Wall; the web page of tweets with the hashtag #media140 projected behind the speaker or panel in real time. A stream of consciousness about the event, at the event. Many conferences these days (IT conferences in particular) have a Twitter back-channel; a conversation among Twitterers about the conference during the conference, but the idea that you show that stream in real time to the audience is, I think, a significant shift in conferencing. I noticed that the ABC-influenced Media140 event in Sydney took a policy decision not to show the Wall in its video of the event. Apart from the obvious potential for people to spam, tweet profanities and send libellous messages, the Wall allows for a diverse commentary and some genuinely funny commentary. My co-blogger @grum was particularly sharp. And we saw the odd situation where panellist @richardgiles was dissing the audience for not asking incisive enough questions. There’s no doubt in my mind that the Wall adds significantly to the entertainment value of the event for those who attend. And it’s far more interesting than watching on-line because you have the tension of the speaker’s reaction to the comment about their bad hair or the fact that they’re droning on. While experienced Twitterers on stage apparently had no issue with the Wall, Andrew Pascoe, the lawyer from Allens Arthur Robinson who knew little of Twitter was clearly rattled by the idea that he was for a time (1) not the centre of attention and (2) not able to follow the in-jokes. Some of my friends to whom I described the scene afterwards were sympathetic, describing the channelling of attention away from the speaker as rude. I think most older people would take that line and I don’t think experienced speakers will countenance it in a normal conferencing situation. To me, it’s giving away some reverence for the speaker in return for a higher level of engagement among the audience. Price worth paying. Furthermore, I believe it is an important differentiator for Media140, which could evolve in the direction of Twitter-powered events, rather than events on how to deal with social media. You can read my other posts here: a tremendously clever joke about media ownership that nobody got, my interview with Brett McCarthy of The West Australian and and an article about time-rich, cynical twitterers. Er, like me. Previous Article← Foursquare – where do you get it? Bret, don’t overstate your case… You know I got your tremendously clever joke because I told you so at the beginning of the day. The Twitter Wall is interesting – it does democratise the conference, giving tweeps as much of a say as the speakers, and yes, it was amusing at times to see Andrew Pascoe have his flappability tested — but just as it was distracting for the speakers, there were many in the audience who found themselves drawn to the wall instead of the speaker. I feel they are two different experiences that are not yet properly integrated. And when you say “price worth paying”, I think that as far as the benefit of the Wall, many people could have (and probably did) get a lot out of the conference without even being there. Earlier in the day, I found it useful when they had favourited (?) specific questions from the #media140 stream, allowing the chair to direct enquiries appropriately. This was far less distracting than the tweep equivalent of jumping in front of the camera and saying ‘Hi Mum’. On the other hand, @richardgiles’ heckling of the audience was gold. lol. Thanks Sabian. Now I’m embarrassed. Yes, I would have liked to have quizzed people in the audience on the Wall. I thought it was pretty well managed though – it wasn’t up all the time. Agree it is also distracting. Definitely not an integrated experience but I think that’s the shift – away from 100% attention on the speaker for some people, some of the time. And yes, non-attendees get a very good sense of involvement from this format; completely agree and I think that’s a real strength of the format. I followed Sydney for most of the day online. The Wall works better when you can see the speaker and the stream concurrently, which you can do online too. It’s just a bit less demanding on the concentration when you’re there live. Questions from the stream are often better than questions from the floor (as highlighted by Richard) but organisers recognise that attendees have paid money and feel entitled to their personal experience. That’s an interesting conflict. ‘Hi Mum’ is the perfect description.